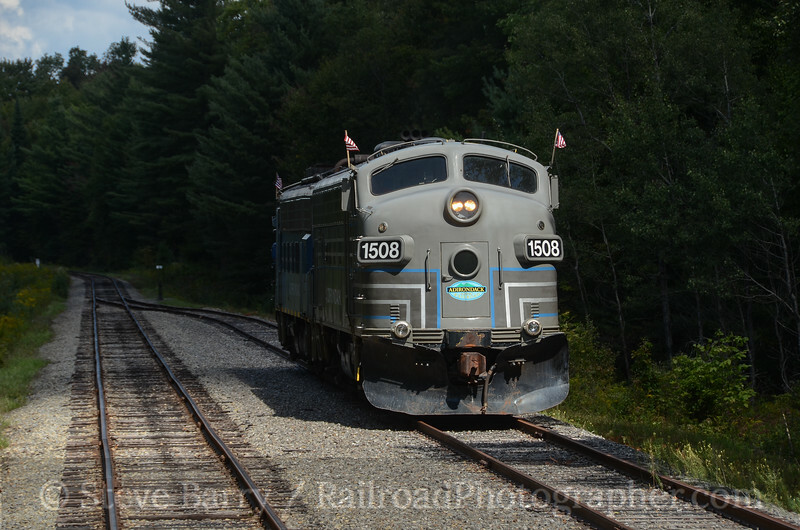 For Labor Day weekend I was invited up to the Adirondack Scenic Railroad to conduct a night photo session in conjuction with a railfan weekend and the 20th Anniversary celebration of the railroad. With events on Saturday and Sunday on the long weekend, I headed north from New Jersey on Thursday night. 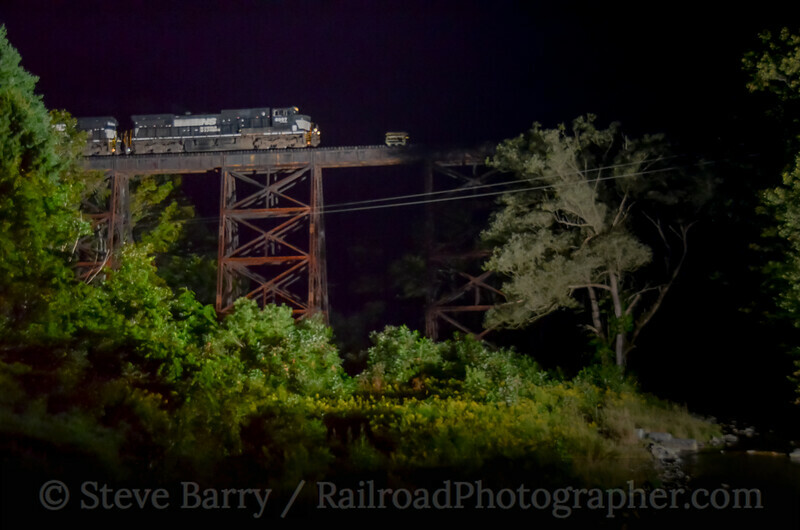 After getting a night shot at Susquehanna, Penn., of a New York, Susquehanna & Western freight under a massive coaling tower (a shot I detailed in this blog post) I continued my scheduled all-nighter by going up to Harpursville, N.Y., on the former Delaware & Hudson (now Canadian Pacific, but seeing a lot of Norfolk Southern traffic) and setting up my strobes for whatever came along crossing the bridge there. I had set up a little before midnight, and got an eastbound train a little later. There was another angle I wanted, so I kept the lights set up and fell asleep in the front seat of the car, hopeful that either a horn or a radio transmission would wake me up if anything else showed. It was a radio transmission that got my attention. A train went through a defect detector just west of the bridge and I cleared my sleep cobwebs, grabbed my camera and ran out onto the parallel highway bridge. A couple of cars went by, probably wondering what I was doing in the dark with a camera pointed at the bridge. I soon heard the train blowing for the crossing just off the west end of the bridge and the train rumbled into the scene. It was only then that I noticed it was 5:30 a.m. and the sun was just beginning to brighten the eastern sky. There wouldn't be time for another train before daybreak, so I tore down the lights, got about another hour of sleep and headed north. The plan was to spend the day on the Water Level Route of the former New York Central (now CSX Transportation). I had never been to Little Falls, N.Y., and did some exploring there, but wound up spending much of the day near Utica. The railroad was absolutely hopping, with trains running non-stop. 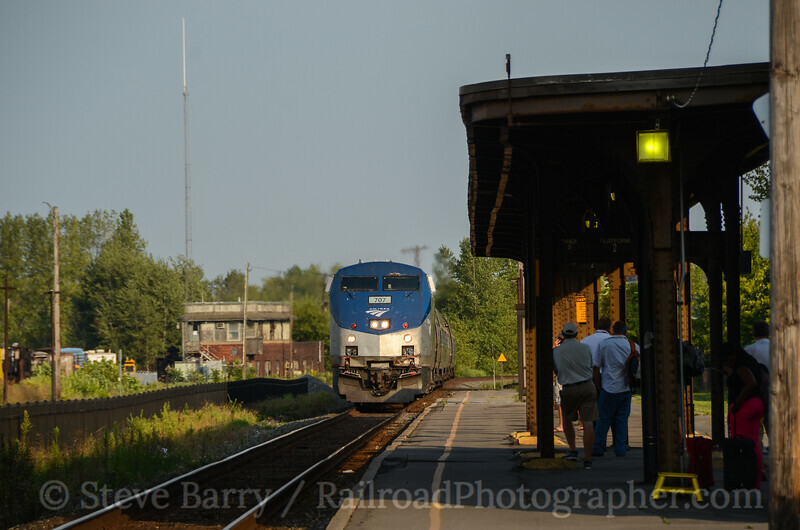 As the day came to an end, I was on the platforms at the Utica Amtrak station getting trains in the last afternoon light before heading to the Adirondack Scenic at Thendara. Lodging would be Van Auken's Inn, directly across the street from the Thendara depot. The next morning I watched the crews put the displays for the railfan weekend together and visited some of the displays at the depot (including a locomotive simulator, where I stalled a train in a snowstorm on a steep grade). The 20th Anniversary speeches occurred when the morning train from Utica arrived, then I rode first class from Thendara down to Otter Lake on the rear platform of a Baltimore & Ohio business car. At Otter Lake the two F-units powering the train ran around to the north end, putting them up against the rear platform for the return trip. Returning to Thedara, we found a rap group making a video on one of the railfan weekend display locomotives -- Mohawk, Adirondack & Northern M420W No. 2045. We watched with amusement as the group danced and recorded on the running boards of the locomotive, then had the rapper and part of his posse pose for a "railroad publicity shot." That evening we did several shots at the Thendara depot for the night photo session. 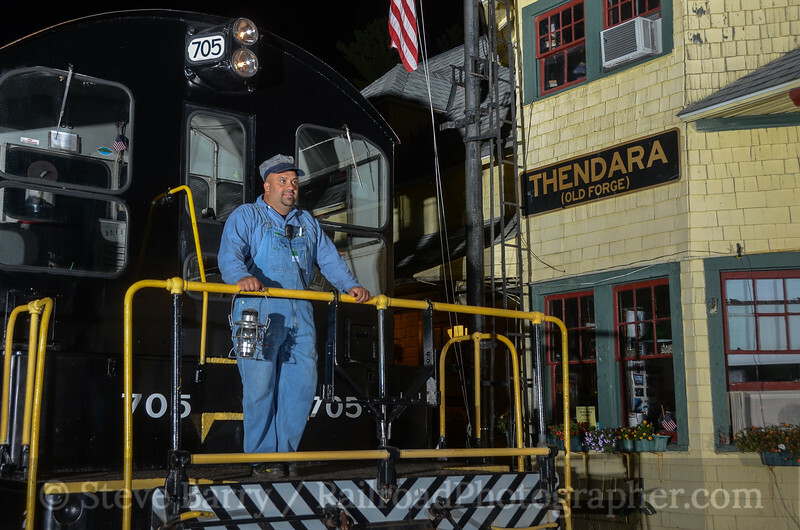 Don Chaudruc, the mastermind behind the railfan weekend, posed in several of the shots at the classic ex-New York Central depot. On Sunday morning I took a drive through the busy tourist town of Old Forge, just up the street from Thendara. 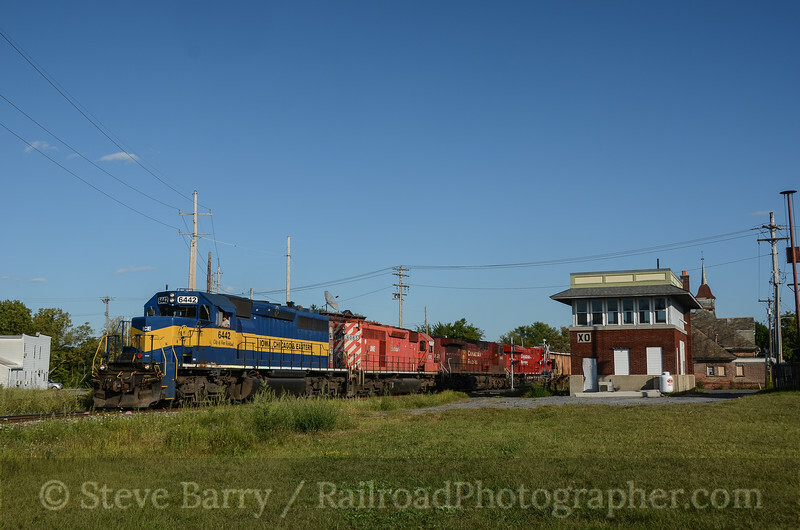 The sun was in and out, but I decided to drive down to McKeever to the bridge to photograph the morning train from Utica behind the railroad's freshly painted RS18s. It was cloudy when I walked into the bridge, but a large hole opened up at just the right time and I got a decent shot of the train in full sunlight (see the top photo in this entry). It was time to start heading back towards New Jersey, so I bid farewell to the great folks at the Adirondack Scenic and drove south (but only after another crack at the locomotive simulator -- this time I took an Amtrak train up the grade, topped the hill and promptly ran away down the opposite side at 80 m.p.h. until I wrecked). 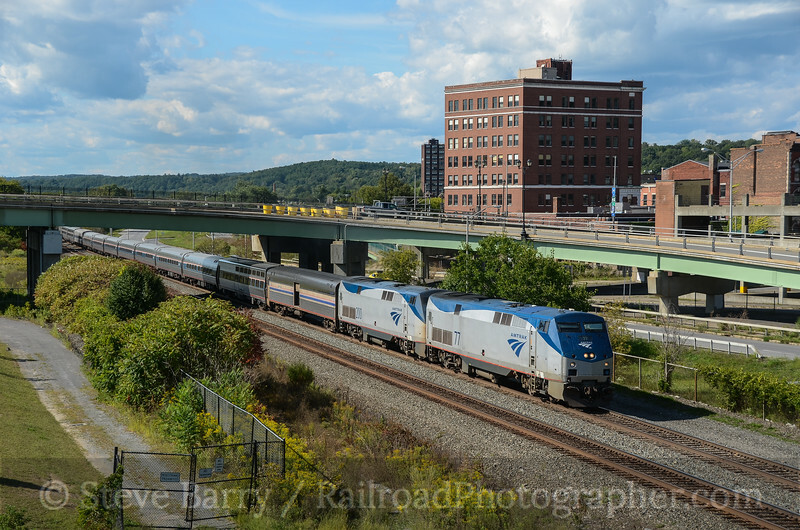 The Water Level Route was shut down to all freight because of a bridge replacement project near Albany, but Amtrak was getting through. 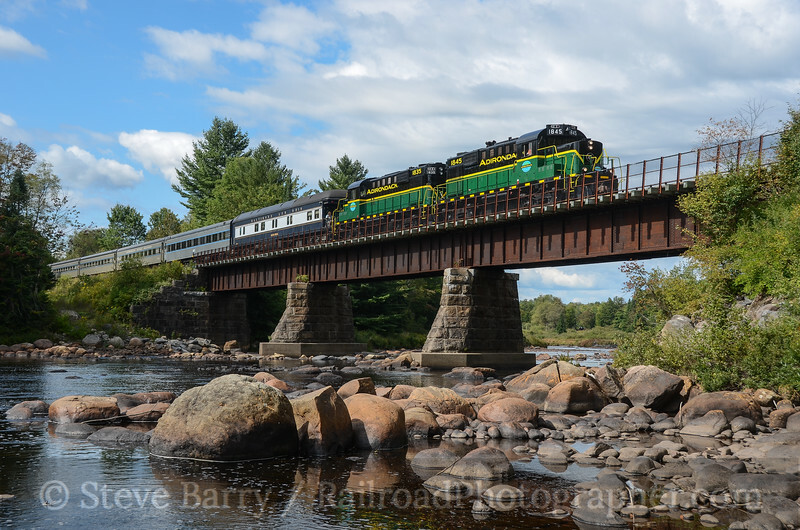 Among the passenger trains I shot, I got the Lake Shore Limited passing eastbound through Amsterdam, N.Y. I had wanted to get over to Mechanicville and check out the restored railroad interlocking tower there. XO Tower at one time protected the crossing of the Boston & Maine and Delaware & Hudson; today it's Pan Am Railway and Canadian Pacific that pass by. Upon getting there, the sun wasn't quite where I expected -- it favored a northbound train, preferably on the D&H. I had about an hour I could wait, so the odds were against me seeing anything shootable -- but just as it was time to leave the northbound signal near the tower lit up and I was rewarded with a northbound CPR train, complete with a locomotive from CP component railroad Iowa, Chicago & Eastern in the lead. From here it was time to head home. A quick stop at the new-ish station at Rensselaer revealed the platforms were off-limits to all but ticket holders, so I packed it in and headed back to the Garden State, wrapping up another adventure.